Welcome to the Smithfield Hog Jog 5K Run/Walk and Piglet Run!!!!! Join us Saturday, October 13th, 2018 for the 17th annual Smithfield Hog Jog!!! Pre-register by paper by clicking here or register online here . 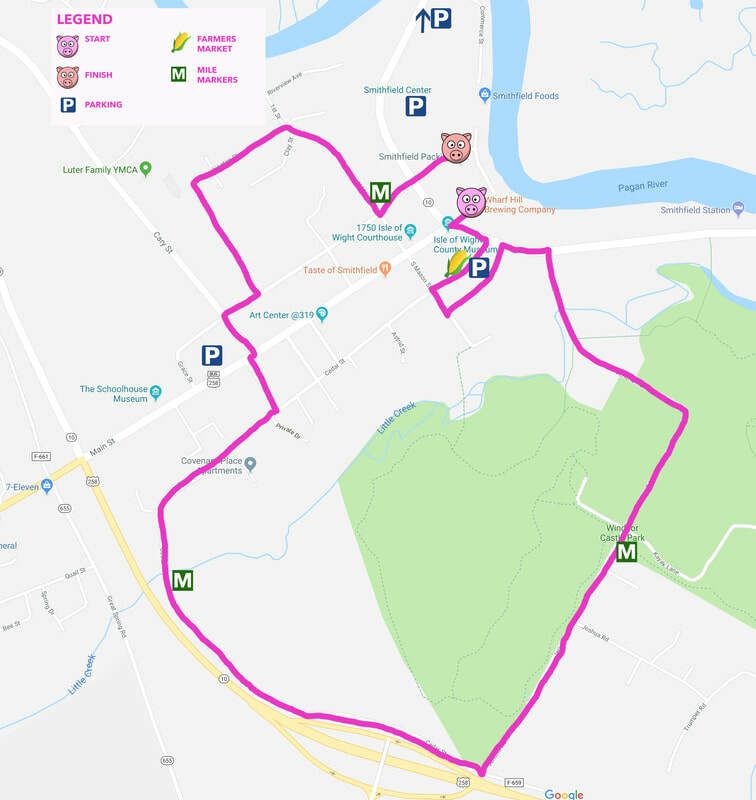 This charity 5k run/walk follows a challenging course through downtown historic Smithfield and our beautiful Virginia countryside. Proceeds from this family & community focused event benefit the Christian Outreach Program. To date, the Hog Jog has raised over $184,000!! Find out more about what Christian Outreach is about here! Our volunteers are the heart of this race, and truly the reason it succeeds each year. We need help before, during, and after the race. Click below to be brought to the signup link! 10:30 AM Awards and Post Race Party featuring Gwaltney hot dogs, soda, and beer. Piglet Run (The kids run is a short sprint designed for younger children). Each child will receive a prize. Groups of 10 or more are only $20 each per runner. Register your group online or by paper registration. Group registrations must be postmarked and delivered in 1 envelope by September 29, 2018. Must have designated team leader to pick up registration bibs and t-shirts. This is your chance to showcase your school, work or social group! Be creative! After the race, join us for beer (if you're of age! ), water, sodas, Gwaltney hot dogs, awards and music. We can't wait to see you!!! Register early and save $5. Pre-registration ends September 29th! Pre-register online or print a paper registration form. Same-day registration available beginning at 7:00 A.M. on Oct. 13th for $35.